The Adventures Of the Olson Clan: Phew! Now into the second trimester! Phew! Now into the second trimester! If you havent heard or caught it. We will be having another kid this Spring! My due date is may 10th, but we will have a sechuled c-section by or around May 3rd at 39 weeks. Wow this time around was much more rougher! I thought Ethans pregnancy was rough lol. Started feeling nauseous around 6 weeks. Random things would make me vomit like: looking/touching lettuce, looking/touching dishes, food commercials, MEAT/smell/eating/looking. So basically the vomiting was preventable if I could stay away from those things lol. Also I was crazy tired while pregnant with Ethan in the first trimester. From the very beg at like 4 weeks! Started getting nauseous at 6 weeks (same time as Ethans). Nothing tasted right or good, but not foods made me vomit. I never did get tired (which is ammazing!) I did however vomit 3-10 times a day. Anytime, anywhere. No cause just came lol. So I was really sick! And it was NOT fun. And no meds worked, they game me zofran which is an anti vomiting/nausea drufg for chemo patients and it just made me sicker. I also had horrible acid, which the nurse would not help with. Finally 2mths in after seeing the doc, the doc got me meds. Apparently like I thought, I was over producing acid. So PHEW! We are entering the 14th week tommorrow and I am SOOO glad the first trimester is OVER. We had an ultra sound at 12 weeks. The baby was huge and looked like a baby. However the pic did not print out clearly and it looks like a blob lol. Heart beat was 165. Nect apt is at 16 weeks. And then after that we will be in AZ. So we are getting a ultra sound in Phoenix to find out the gender! Dec 18! 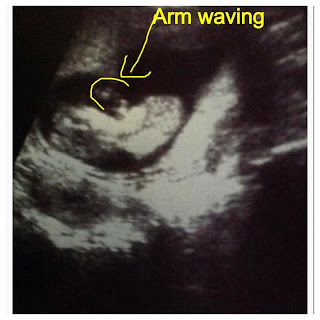 :) I started feeling the baby at 11 weeks fluttering around. I heard you guys were expecting #2. Congrats to you both! Ethan is completely adorable so I know you'll have another cutie! Take care!